On the K Road end of Ponsonby Road, behind a heavy dark door and blacked out windows is Ponsonby’s latest Japanese restaurant – Azabu. With a Japanese menu that include dishes that pays homage to Nikkei cuisine (aka fusion of Peruvian-Japanese), the eatery is co-owned by Executive Chef Yukio Ozeki from previous establishments such as Lucky Lucky Dumplings and Ebisu. Coming in without a booking, we were offered a table at the raw bar where we could see the chefs at work. From preparing the tostadas and assembling the sushis, it was a privilege to see them work their magic where they showed off their intricate skills and prepared works of art for their guests. 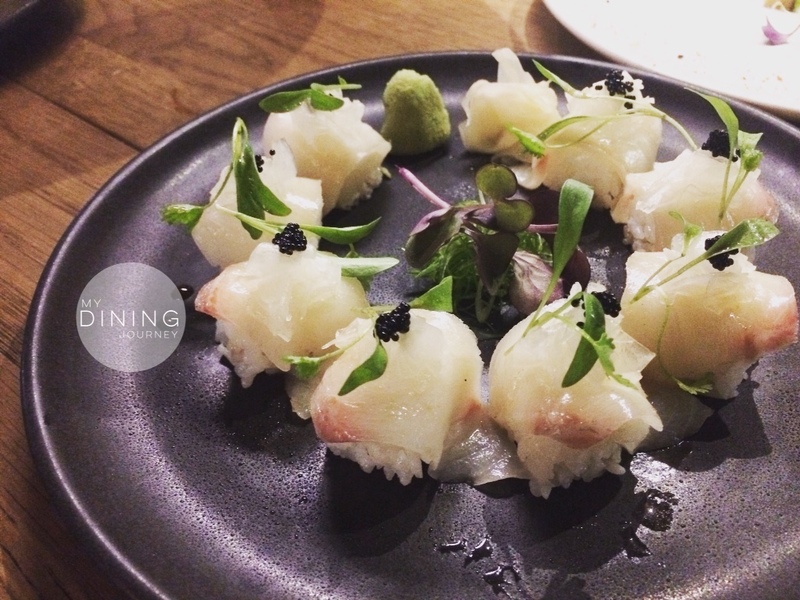 Our hamachi kingfish sushi roll with pickled daikon and yuzu ponzu were divine. The sushi rice was perfectly cooked and the delicate slice of kingfish was fresh and lean. 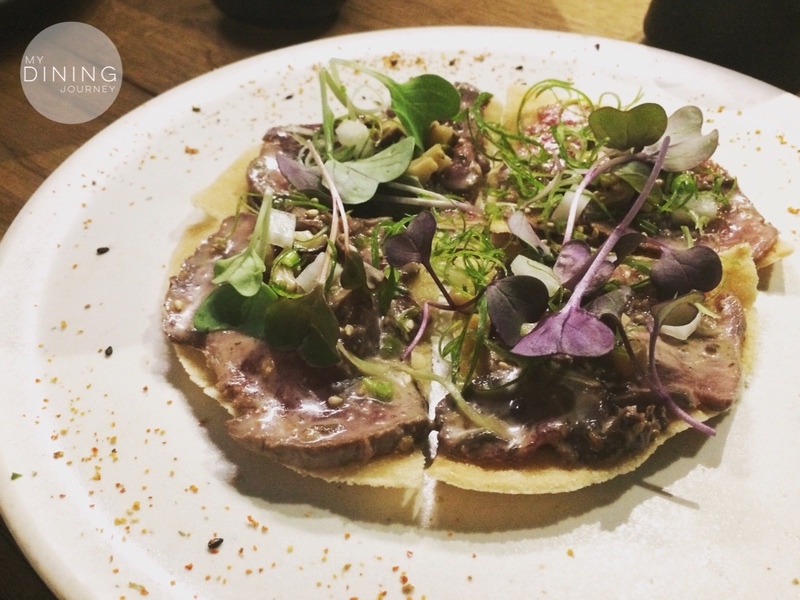 The beef tataki tostada is a Japanese take on a Latin American dish and consists of a crispy tortilla with a shiitake mushroom, pickled daikon and micro green topping, dressed with a fabulous truffle sesame sauce. An interesting way to serve beef tataki and we loved it! Our salad of choice is one that is not on the menu – a tomato and tofu salad which turned out to be rather mediocre. It relied heavily on the natural sweetness of the tomato and lacked a decent dressing. This made the tofu taste rather bland. 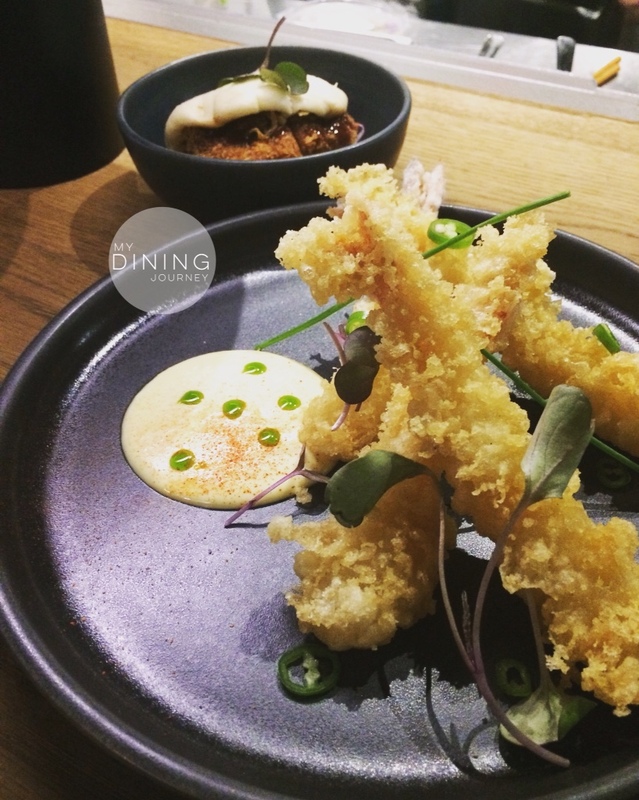 The tiger prawn tempura with aji amarillo mayo and jalapeno ponzu were crispy on the outside and juicy on the inside, I particularly enjoyed the kick from the ponzu dressing. The chicken katsu bao (at the back) with tonkatsu sauce and fried onion was a run-of-the-mill bao that I find a little overplayed in the Auckland dining scene. Tasted fine, but nothing special. 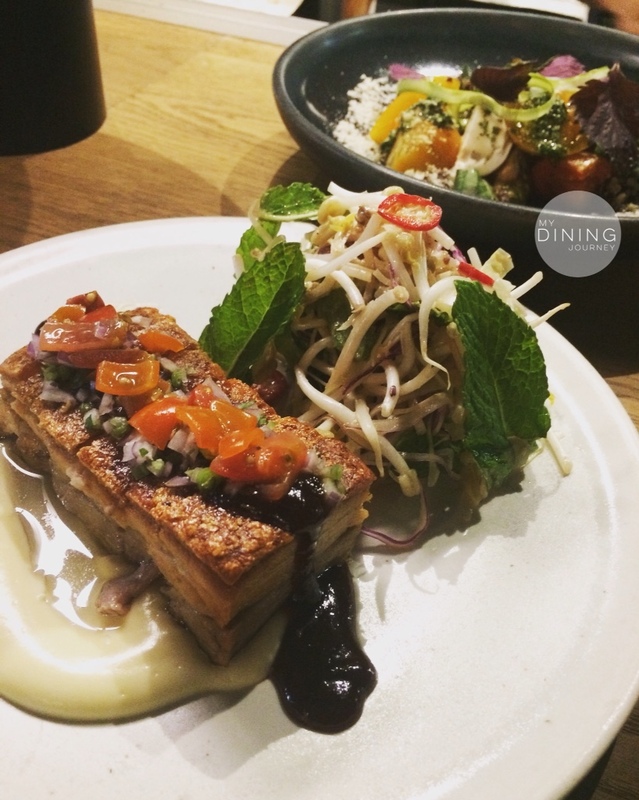 We ordered only one dish from the main section and the crispy pork belly called out to us. Looks are deceiving, this dish may appear to be small but the rich pork meant we just managed to finish the pork. The spicy miso glaze with parsnip puree was a good pairing and the pork just melts in your mouth. We were quite full from dinner but our friendly waitress highly recommended for us to give their desserts a try. 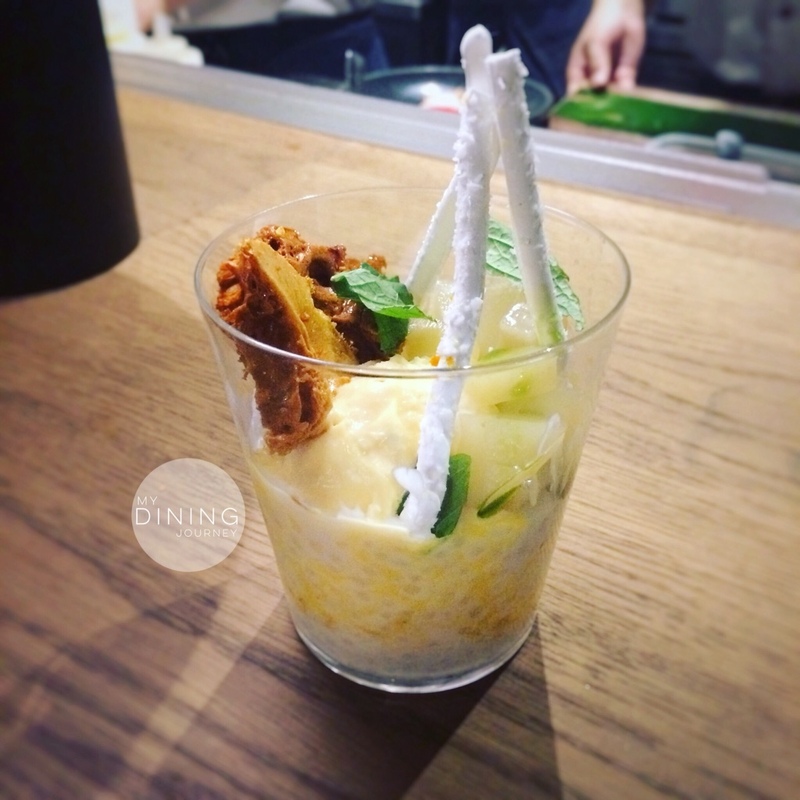 We opted to try her favourite which is a tapioca pearl dessert with orange coconut meringue, sake poached pear, honeycomb, mango puree and vanilla ice cream. Boy, we could see why she liked this so much! A light and tangy dessert balanced with sweetness from honeycomb, it was a refreshing end to our meal. Verdict: Delicious Japanese food with more hits than misses. Would definitely come back again to try more of their dishes! 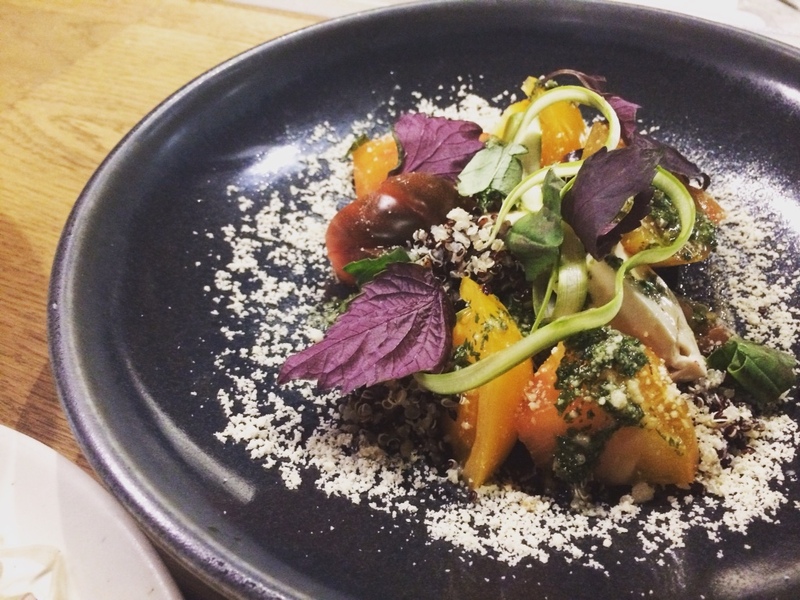 This entry was posted in Above Average, Auckland, Bistro, Dinner, Japanese and tagged Auckland, Auckland Eats, dinner, Japanese, Japanese Dining, Japanese food, Ponsonby, Sashmi, seafood, Sushi. Bookmark the permalink.